Euro Quest 2013--First time at a Con! Attended my first Con this weekend at Euro Quest. What a great time--lots of laughs and some great games! 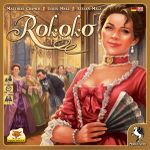 Within an hour of arriving, I was playing Rokoko with 2 friends. Cute little game with a few decisions to be made. Gorgeous components and art work. Had to stop mid-game so they could use it as a demo, but enjoyed it while it lasted. Was then introduced to Lewis and Clark (the game, not the actual people...never mind, I'm sure you knew that). What a great game! Very different mechanics with a twist to hand-management while collecting resources so that you can be the first to arrive in Oregon...very cool. After hearing the directions and thinking, "Am I an idiot b/c I'm clueless? ", once my turn came around a few times it began to click. Of course I lost...(You'll see that theme throughout this post.) Still a wonderful little game. 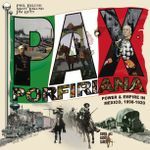 I had learned Pax Porfiriana almost a year ago and I had to relearn it this weekend. Took another game for me to say, "ok", now I know what I'm doing. I was determined to play again before I had forgotten what I had learned, so later in the day, we did. Did much better, but still l_ _ _! (There's that "L" word again!) I had a ton of "Outrage" and was set to do some toppling, but it just didn't work out. Great game packed in a tiny box. Off to defeat some zombies! 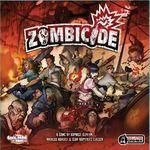 Played Zombicide for the first time. Pretty cool. Once we straightened out the movement rule it flowed a little better. Had to sacrifice a roller-skater, but it was not in vain. Nice little game and can be played in about an hour--right up my alley. Left my "group" and found a very nice father/son table that allowed me to play Guildhall. Very cute, in your face, screw you kind of game. Had a great time. Almost won--got my "dancer" assassinated so there went that. I'm buying this one and I can see it coming to the table in between some of the longer games we play. Played a game of Ladies and Gentlemen. That was rather laborious. Good job K_ _ _ for trying to learn the game and keep 9 other guys occupied--not an easy task. Wasn't a fan, but may have been better in a different setting. while 2 of my playing friends went to play Werewolf, I played a game of Castles of Burgundy. Loved it! Thanks G _ _ _ for the suggestion. I hope my wife loves it too. While other members of my playing group were finishing up a game of LoW, a nice person came over and taught me the game. Got my a _ _ handed to me, but it was fun. 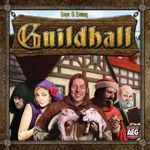 This is going to be on the same order form as Guildhall. Crossing my fingers that the lady likes it as much as I did. Oh, and thanks B _ _ _ and P _ _ for staying up until 2:30 to finish the game. 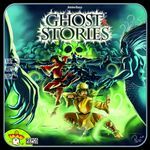 After 4 hours of sleep and breakfast, I headed back to the gaming room for a wonderful co-op called Ghost Stories. Thanks to P _ _, L_ _ _ _, and B _ _ _ for waiting for me. Came down to the wire, had a chance to take out the big incarnation, but the dice were not our friends that day. Still had a wonderful time playing a game with great art work and nice components. Great way to finish up the Con. Loved the con, but it was nice to see the sun/trees again. I was starting to lose my summer tan!